Southern States Traditions Chick Start & Grow (AMP) Medicated is a complete starter and grower feed for meat and egg type chicks. Medicated with Amprolium as an aid in prevention of coccidiosis. An economical formula that provides complete and balanced nutrition without compromising on quality. 18% protein crumbled complete feed. Starter feed for meat and egg type chicks. Contains Amprolium. As an aid in the prevention of coccidiosis. Simple and convenient program. Only one feed needed from hatch to 16 weeks for egg type chicks or hatch to market weight for meat type chicks. For customers seeking a good value. Complete and balanced nutrition for growing meat or egg producing chicks. Egg-Type Chicks - Feed continuously as the sole ration from hatch until the birds are ready to lay eggs. At that time, feed the birds a Southern States Complete layer or breeder feed. 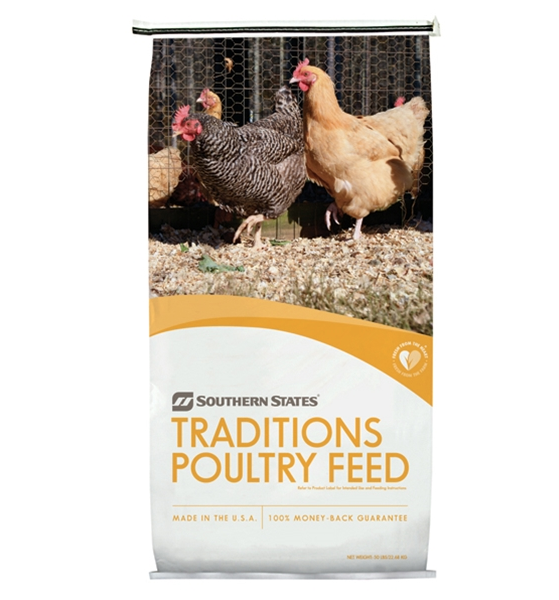 Meat-Type Chicks - Feed continuously as the sole ration from hatch until market weight. Warning: Use as a sole source of Amprolium.